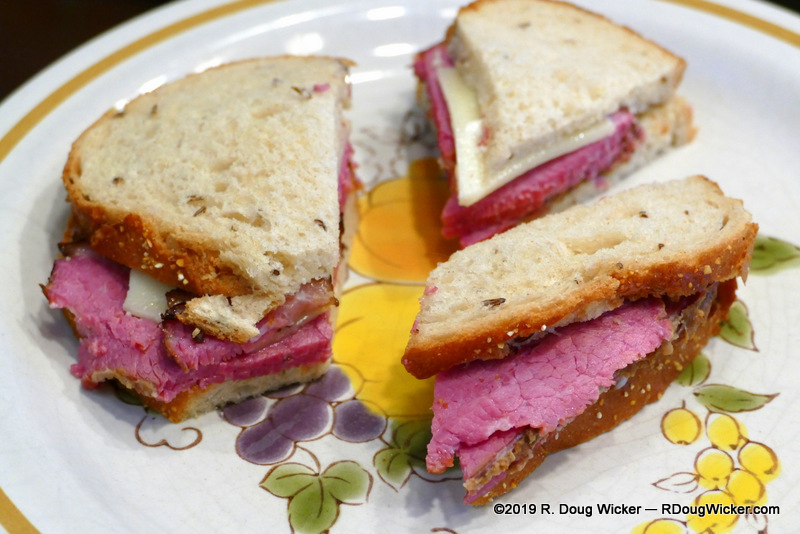 Today I’m going to reveal my secret to duplicating (as best I can) the incredible pastrami that comes from the incomparable Katz’s Delicatessen. It’s not that difficult to do, and although I’ll be the first to admit Katz’s is still better, I believe this comes as close as you’re going to get short of a trip to New York City. 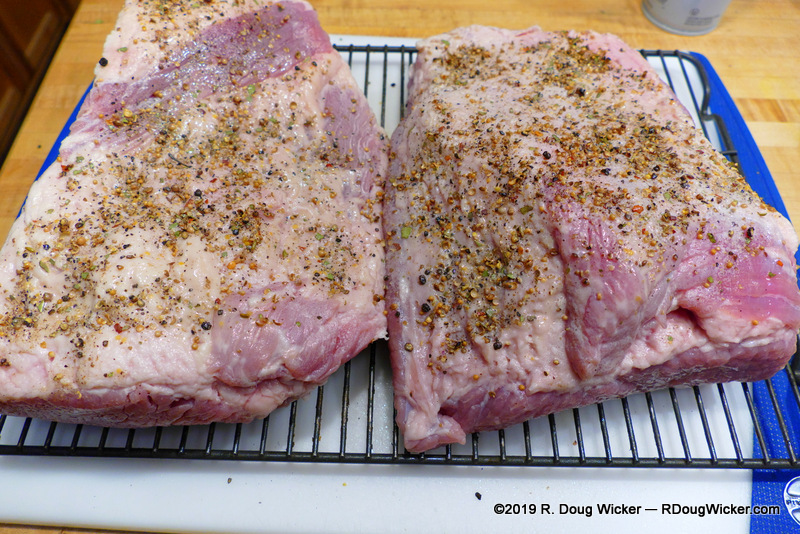 But before we work with the seasonings above, let’s prepare the corned beef briskets. 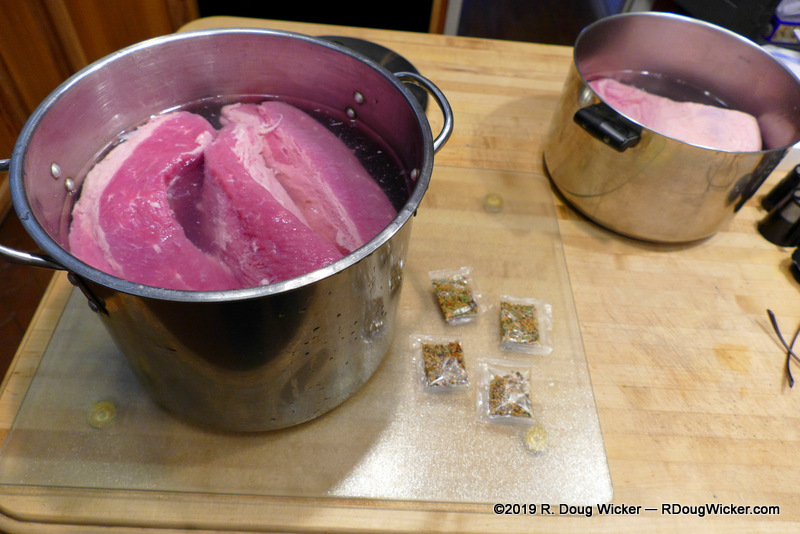 Corned beef straight from the vacuum-sealed pack is rather salty, which is why you boil it. 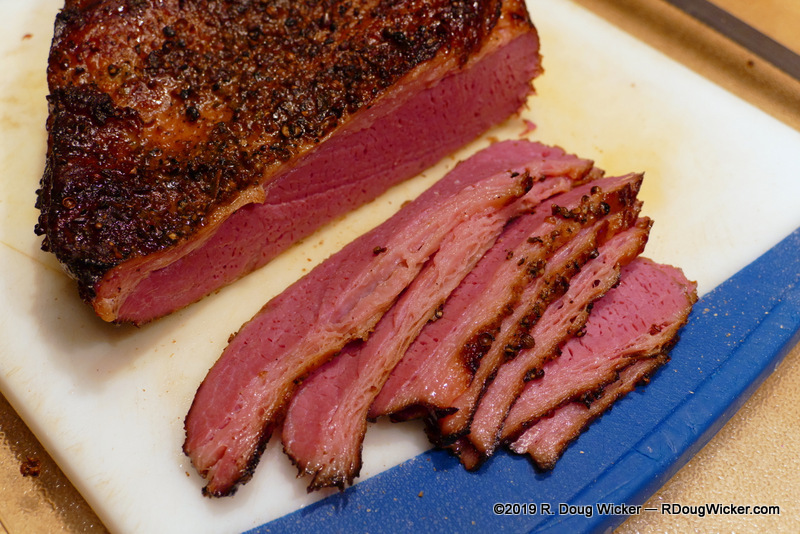 But you don’t want to boil a brisket that you’re going to smoke into pastrami, so forget that. Instead, soak your briskets in cold water for 24 to 48 hours, changing the water several times. 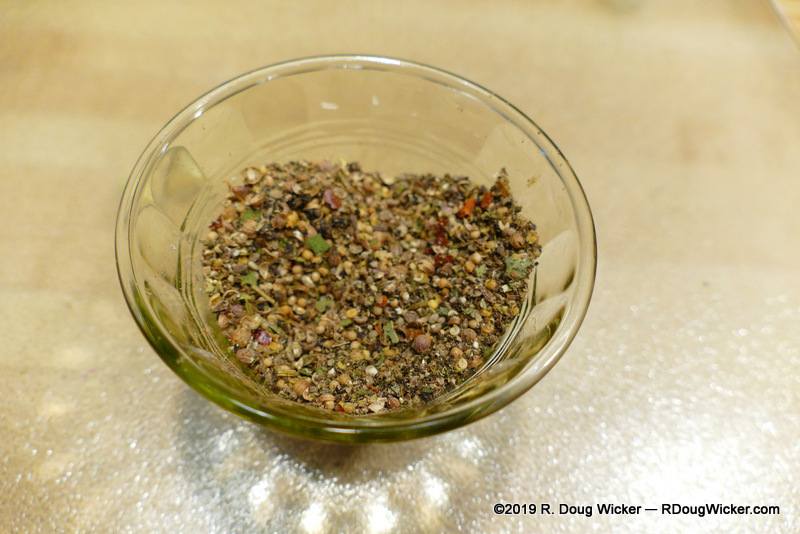 Now that the brisket is soaking, let’s get back to those spices. 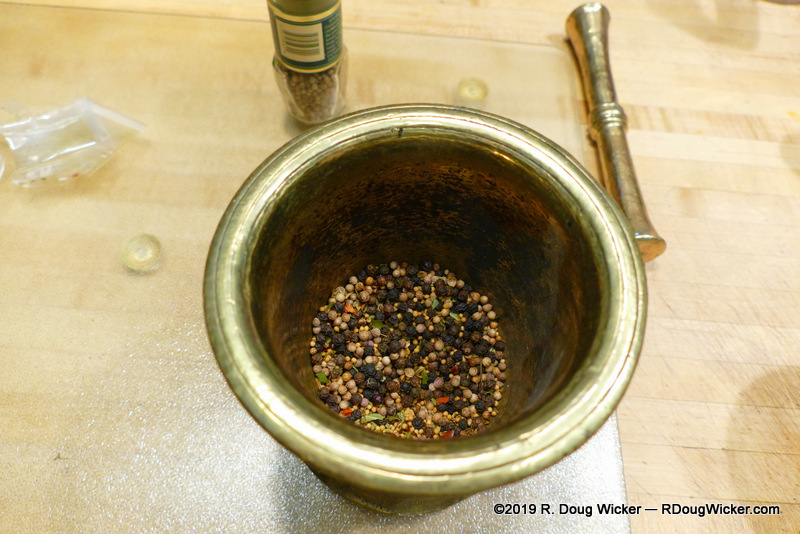 Using a mortar and pestle, or if you don’t have the patience, a spice grinder, crush together the pickling seasonings that came with the brisket along with additional black peppercorns and coriander to pad out the amount of seasoning available. 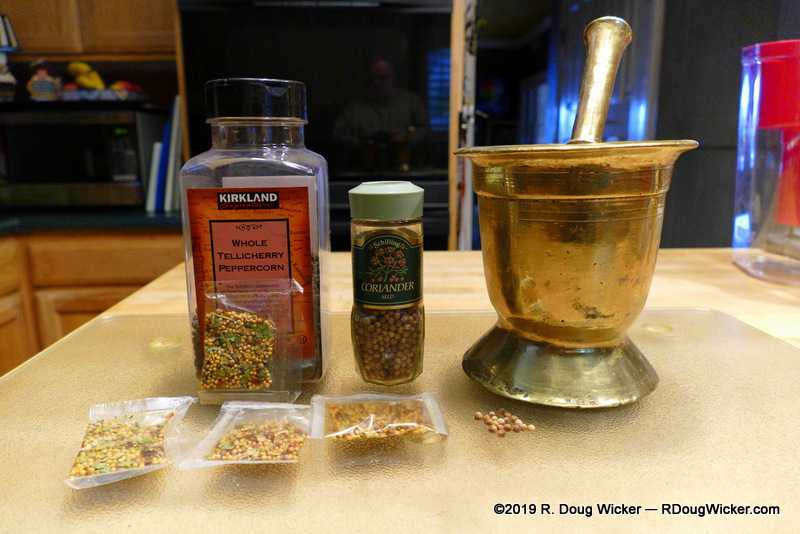 Now rub vigorously the spices into the corned beef briskets. Putting a little oil onto the meat while your doing this won’t hurt, either, but it’s not absolutely necessary. 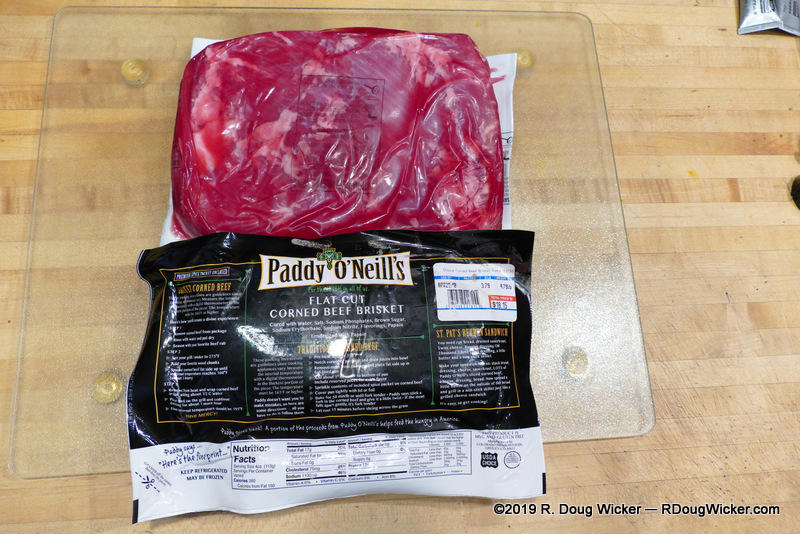 Wrap tightly the briskets in plastic wrap and refrigerate overnight. The next day load up the smoker. Make sure to keep up your water levels to prevent the briskets from drying. Maintain a temperature of 225°F/110°C. What wood? Whatever you like. I used hickory, and that seemed to work just fine. I suspect apple, cherry, or even pecan would also work well. Keep up the smoke for at least three hours into the process, after which you can concentrate on just maintaining water levels. But you’re not done yet! 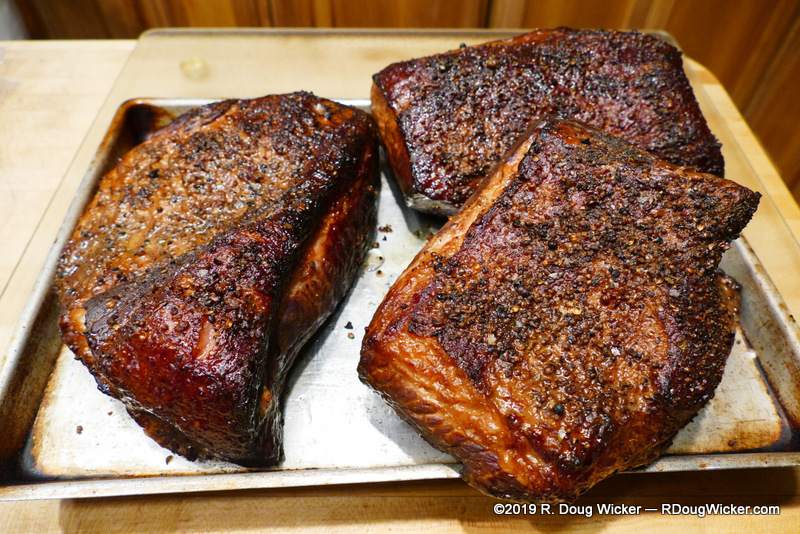 If you’re having the pastrami the next day, allow the briskets to cool and then wrap tightly with plastic wrap and put them in the refrigerator. If you hunger for this for dinner, continue to the next step (which you would instead do the next day if you decided to wait). That next step is to place your briskets onto a rack over a roasting pan, and to place water into the pan below the level of the meat. 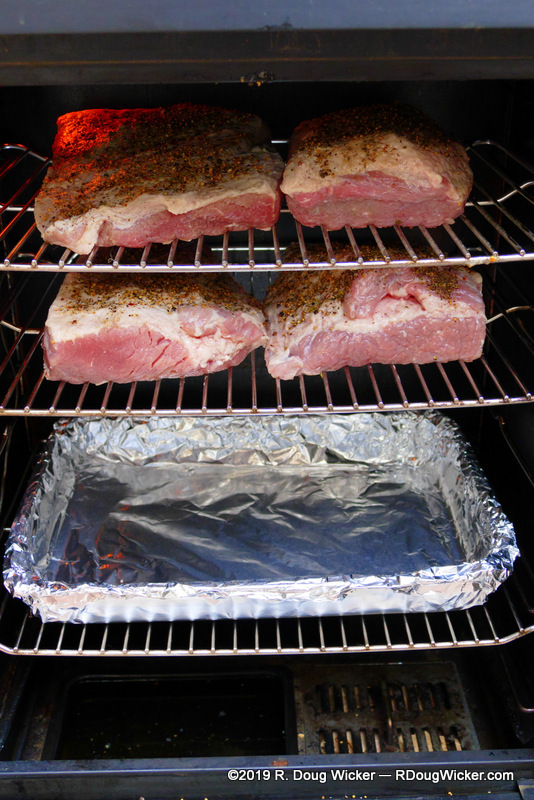 Tent heavy duty aluminum foil over the roasting pan and rack, making sure that the foil does not come into contact with the meat. 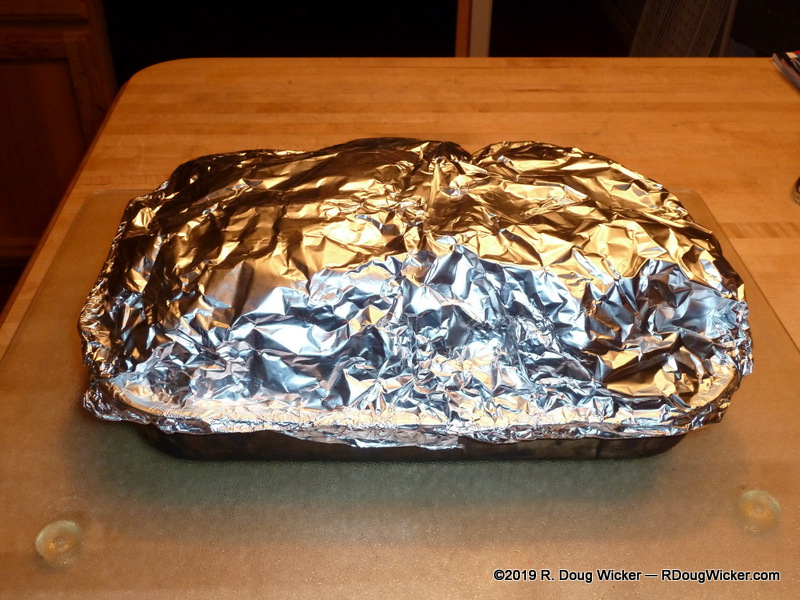 Wrap tightly the foil around the edges so as to trap steam from the water in the pan. 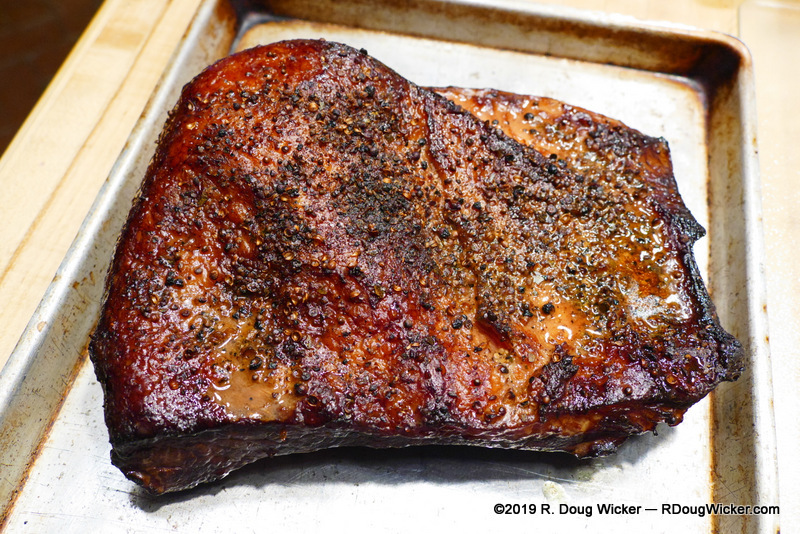 Steam the smoked briskets in the oven between 250°F/120°C and 275°F/135°C for two to three hours — thicker steams longer; thinner steams less. 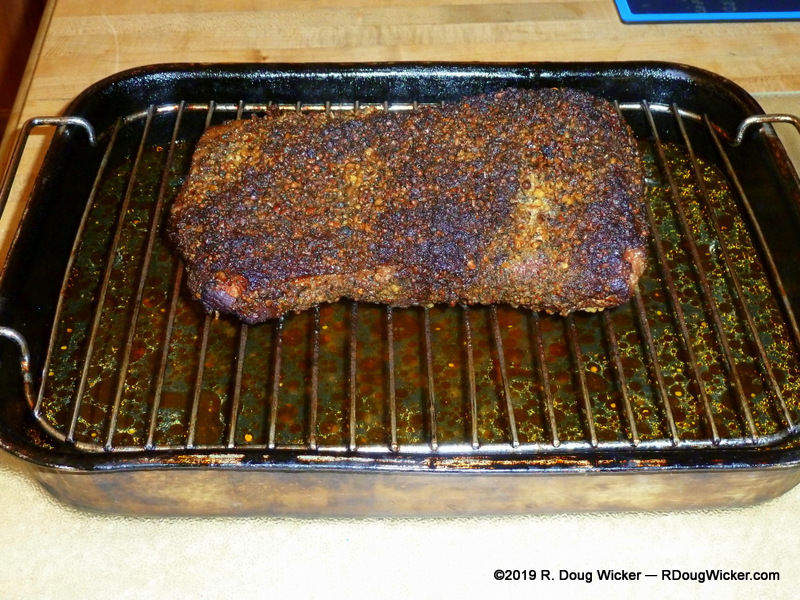 Take the briskets out of the oven, keeping the meat, rack, and pan tightly wrapped. Allow to cool gradually for at least 30 minutes or so. Remove the foil while taking care to avoid steam burns! Now slice the brisket and thinly as you can. Get a nice Jewish rye bread, some mustard, and a good quality Emmenthaler cheese (that’s what we call Swiss with holes), and build your sandwich! Normally, this is the point where I give a wine pairing. But, hey, we’re talking pastrami here. That calls for a light ale! If I absolutely had to pair a wine with pastrami, however, I believe I would lean toward a lighter, fruitier red. Here I’m thinking pinot noir, petite syrah, sangiovese/chianti, perhaps even a tempranillo. If I wanted something a bit more robust to compliment the smoke flavor, I might try a zinfandel, but a shiraz would probably be a grape too far.